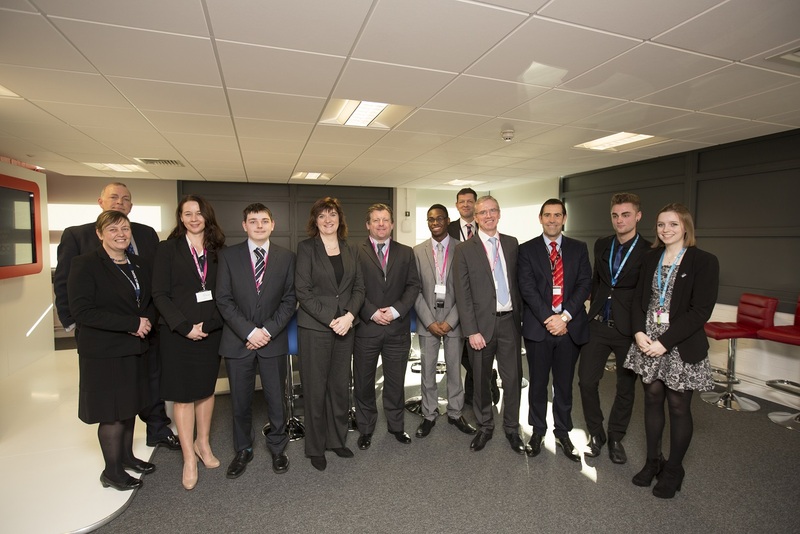 Nicky Morgan visited UTC Reading today (28 January) to meet its staff, students and industry partners. The Secretary of State for Education toured the UTC’s specialist computer science, science and engineering workshops and met former students who have now secured apprenticeships and sponsored degrees with its industry partners. The visit to UTC Reading follows its outstanding Ofsted rating last summer, making it the first University Technical College in the country to be awarded this rating across all areas. Nicky said: "What is clear from visiting today is how engaged the students are in their learning and how aware they are of the opportunities around them. This is part of what makes this an outstanding UTC. "The role of the UTC’s industry partners in shaping the educational offer is exactly what we want to see. These partners were not only involved in getting the UTC launched but are now critical in running projects and providing mentoring and work placements. "I was keen to discover how the students found out about the UTC because, as a new model, we have more work to do to promote it to others. At the same time we want to raise awareness and understanding amongst pupils and parents of the value of a technical education and the opportunities this provides to progress onto apprenticeships, as well as onto university." Year 13 student Jordi Clancy told Nicky why he chose the UTC. He said: "I had already done a year of A-levels at school when I heard about UTC Reading. It offered a new way of learning which suited me and an opportunity to specialise in engineering. The students and staff here work collaboratively, which makes it feel more like a business environment." Nicky met representatives from UTC Reading’s industry partners, including Microsoft, Cisco, Peter Brett Associates and Fujitsu. These included Thomas Stanley, who finished at UTC Reading last summer and is now completing a degree sponsored by Fujitsu. He said: "I came to the UTC when it first opened. This felt like a bit of a risk because we didn't know if it would be a success. Now of course the school is extremely successful. Before coming here I thought I would take the typical route to university, but working with the industry partners opened my eyes to new possibilities and the sponsored degree is a great next step for me." Joanne Harper, Principal of UTC Reading, said: "The visit was a great opportunity for our students to explain exactly why they chose the UTC and what they are getting out of this unique learning experience. It was also an opportunity to highlight the community of industry and academic partners which are integral to the educational offer. "We know that the government is keen to encourage more young people to consider apprenticeships as a viable route into employment. Last year nearly 47 per cent of our Year 13 students went on to secure apprenticeships, the vast majority with our industry partners. The UTC model provides young people with the academic and technical skills required to meet the needs of businesses and to give them the edge over their peers."